Ellie Kreiger has been a kitchen staple for us these past couple years. She has brought 3 cookbooks to our kitchen that have all become indispensable. Each recipe is based on making healthier and most of the time- fresher more flavorful- versions of our favorites. Cooking from her books makes us feel good about what we make and what we are eating. 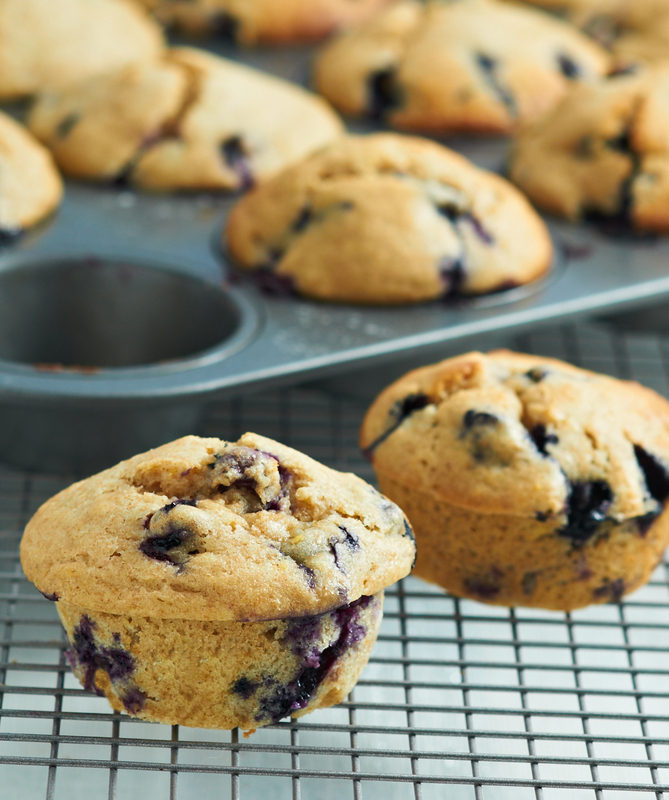 In her latest cook book, Comfort Food Fix, she shares a healthy spin on classic blueberry muffins and true to form, they are just as tender and delectable, our all time favorites still will always be the Fig Muffins, however! Using half whole wheat flour, low fat buttermilk, applesauce and zest of lemon are all ways in which these muffins add a nutritional punch and flavor to a muffin! Position a rack in the center of the oven and heat the oven to 400°F. Coat a 12-cup standard muffin pan with cooking spray. In a medium bowl, whisk both flours, the baking powder, salt, and baking soda. In a large bowl, whisk the eggs, sugar, and oil until the mixture is pale and slightly frothy. Whisk in the applesauce, lemon zest, and vanilla. With the whisk, stir in about half the flour mixture, then half the buttermilk. Repeat with the remaining flour and then the remaining buttermilk, stirring until well incorporated. Divide the batter among the muffin cups, filling them to the top. Tap the pan on the counter to remove any air bubbles. Bake until a toothpick inserted in the center of one of the muffins comes out clean, 20 to 30 minutes. Let cool on a wire rack for 15 minutes. Run a knife around the muffins to loosen them and then unmold. Serve warm or let cool completely and store in an airtight container at room temperature for up to 3 days, or wrap individually and freeze for up to 3 months. This is a gem of a recipe from our very new Eating Well Cookbook! 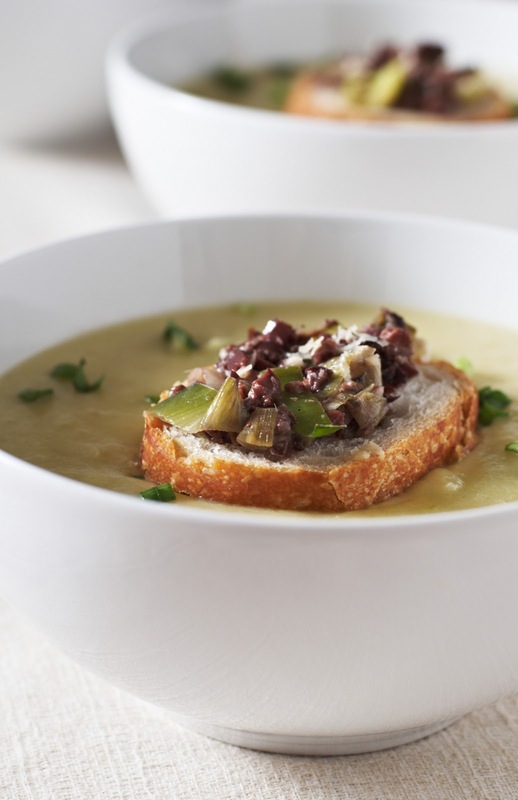 It’s a great velvety smooth, thick, rich creamy potato soup ( think delicious mashed potatoes! )- next time we’ll keep some potatoes chunky and add some peas and lean ham to give it more stew texture and mix this up a bit. 1.To prepare bisque: Heat oil in a Dutch oven over medium heat. Add leeks and 1/4 teaspoon salt. Cook, stirring occasionally, until very tender but not brown, 20 to 30 minutes. Adjust heat as necessary and add a bit of water if needed to prevent sticking. Set aside 1/3 cup of the leeks in a small bowl. 2.Add garlic and red pepper flakes, stir for a minute then add potatoes, milk and broth to the pot. Bring to a simmer (do not boil) and cook, stirring occasionally, until the potatoes are very tender, 15 minutes. 3.To prepare croutons: Meanwhile, add olives, anchovies and black pepper to the reserved leeks; mix well. Divide evenly among the toasted baguette slices. 4.When the potatoes are tender, remove from the heat. Puree the soup with an immersion blender or in batches in a regular blender. (Use caution when pureeing hot liquids.) Season with the remaining 1/2 teaspoon salt, lemon juice and white pepper. Divide among 8 soup bowls and float a crouton on top of each. Garnish with chives and Parmesan, if desired.